Quite bright, very classic varietal characters, plenty of fruit and grassy cat piss vegetal notes. Very basic, clean and fresh, nice fruit not heavy or overly ripe, not tropical, good balance pleasant more of an aperitif style wine. Freshness is the key. More subtle subdued and elegant, delicate yet ripe fruit, somewhere between pear and citron. Riper fuller mouth feel but still very pure and fresh. Slightly rounder with a little more warmth and depth to it. Lingers on the palate longer than the previous wine, introducing a little more savoury character. Quieter and more assured, some intensity and depth aromatically, slightly shy fruit. Much broader and leaner on the palate, more depth and minerality again, more sea-shell characters, I want some oysters with this wine. Tight and focused acids, purity yet some extra dimensions that will develop in time. A little more expressive aromatically, showing more vegetal herbaceous notes, even a hint of spice as well. Good ripeness, well integrated but also complex fruit, nice balance and minerality spice coming through on the palate. Certainly more varietal in character but still sancerre. Texture and some depth. Deeper more complex nose, somehow earthier and even a little mealy in the nose, perhaps through natural ferment and lees-stirring? Some complex cheesy characters showing through. Fuller yet all on the mid-palate, quite dense but nor seeing the right balance or extension on the palate. Back to minerality and sea-salt influence aromatically, purity of fruit, a little floral as well. Depth weight and power, very expressive and full fruit. A little bit warm though, heavy on the alcohol out of balance. Quite concentrated but also disappears on the back palate relatively quickly, also quite green. Very quiet and complex nose, not showing much for now, perhaps even a tad reductive. Great depth and intensity on the palate, a full textured ripe mouthfeel with some alcohol to support. Very powerful expression a lot going on, but the oak is very young and dominating for now. Needs one year to subside and open up a little before drinking. Ripe rich yet savoury, very complex creamy and toasty, floral but also ripe fruit and dried/toasted herbs. Full expressive and concentrated fruit, dense toasty yet subtle oak, good structure, great complexity, minerality showing very well, slightly flat and sour finish though, still developing? Quite intense nose, very floral but also some sweet(?) sea shell notes, juicy almost tropical fruits, even a bit candied. 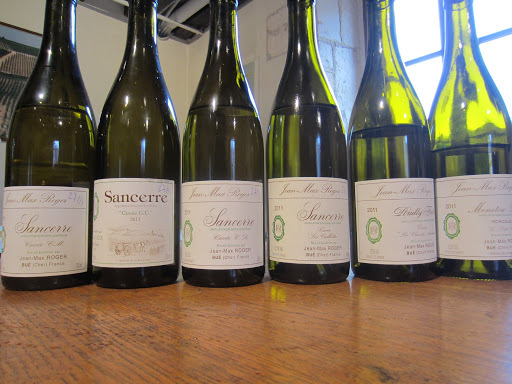 Soft subtle smooth and rich, yet showing some nice maturity and depth, broad and silky through the palate, does sancerre gain more sexiness as it ages? Probably. Generous yet mysterious. Tighter more acidic tropical fruits, particularly pineapple, minerality comes through a little later. Oak has subsided and integrated by now, barely noticeable. Wonderfully complex yet still very alive, youthful and rich, great layers and waves across the palate, excellent balance of fruit and savoury, still plenty left in it. Meaty and mature on the nose, a tad flabby and probably on the way out. Pleasant but lacking enough freshness and fruit. Good acids though. Brighter tighter and juicier, more inviting on the nose. Good berry characters, but still an interesting meaty edge to it. Nice and savoury, a complex nut and cheese side to it. Concentrated, a little bit of woody vegetal character, certainly a food wine. Very light in colour. Bright fresh fruity berry notes, lively and enthusiastic almost like a Beaujolais. Fresh juicy cherry and strawberry, great crisp light and fresh varietal style. Pretty good for the style, good value, an excellent quaffer. Quite soft clean nice and precise, very focused and pure, but with some complexity as well. A touch savoury around the edges. Lovely depth balance finesse and elegance, nice minerality and supportive acids, clean and precise in terms of varietal character, intense but not at all heavy. Great character. Deeper tighter toastier nose, darker berries and more concentration. Juicy full fruit expression, dense and more tannin from fruit and oak, more powerful and expressive, but softens quite nicely on the back. Still early needs a few more years to soften around the edges. Soft and lean, good red fruit with a hint of mint herb and rosemary. Bright intense yet very balanced and fresh, intense on the mid-palate, quite full tannins and slightly masculine on the back. Fuller expression, some poached pear in red wine. Deeper and certainly more appealing to lovers of fuller red wines. Very closed and shy on the nose, yet to open up. Full silky and expressive but still with good tannin concentration. Still developing and softening, actually some excellent potential. I’m being more impressed with the red wines of Sancerre. Toasty slightly meaty nicely concentrated, dense but subtle fruit. Excellent balance, very pure yet complex great fresh fruit but some minerality coming through, juicy bright fresh yet complex with good length. A very pretty nose, some floral elements with the fruit, elegance yet approachability, depth yet brightness. Classic pinot noir characteristics, soft silk tannins, some tasty new oak very late on the palate showing there is still plenty of youth left in the wine. Very long and complex, continues to evolve. Classic pinot noir maturity, dense but showing more mushroom earthy notes. Developing a little quickly to be honest, not sure about the more recent vintages standing the test of time. Still excellent for the price. Toasty and very concentrated youthful tannins, much fuller and denser than the younger wine. Very different extraction maceration. A very nice stink to it, needs to breathe a little bit to open out. Classic burgundy style of old world with lots of wild complexity. Some serious Asian food characters; reminds me of eating at a Vietnamese/Chinese restaurant on Victoria Street, Richmond. Classic umami! Bean shoots.